Using a taller Smith and Jones aluminium block, engine capacity is enlarged to 2.2 using an NMS designed longer stroke Farndon crankshaft and rods. NMS designed forged pistons with a compression ratio dependant on fuel type. Dry sumping is now highly advised especially if being used with a sequential gearbox with flatshift. The cylinder head now receives the largest possible exhaust ports on the standard head casting. (Or use of a Smith and Jones recast large port head) All 16 valve seat inserts are replaced in the cylinder head for oversized items to allow the fitment of even larger valves. Fitted with suitable solid lifter cams, NMS manufactured inlet manifold, and split pulse exhaust manifold, and either a Garrett HTA40, Borg Warner EFR9180, or Precision PT6466 CEA. Safe maximum rpm is 9000rpm. For Cosworth gearbox & clutch upgrades please see our Cosworth Transmission Upgrades section. 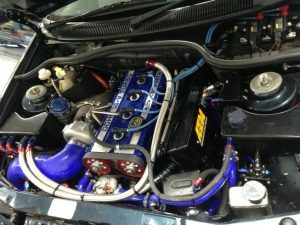 For Cosworth ECU management conversions please see our Cosworth Remapping & ECU Conversions section.